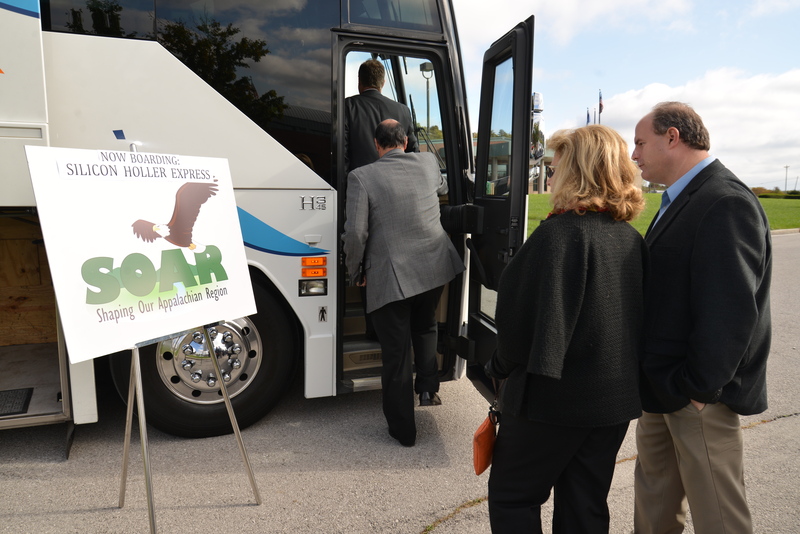 Rogers Leads Tour of "Silicon Holler"
U.S. Rep. Harold "Hal" Rogers (KY-05) served as a tour guide on Wednesday, October 22, as 50 leaders from across southern and eastern Kentucky boarded a tour bus, dubbed by Rogers as the "Silicon Holler Express." The tour was designed to help leaders of the SOAR-Shaping Our Appalachian Region organization learn more about five sophisticated facilities currently utilizing high-speed Internet along I-75 in southern Kentucky. Each company displayed the types of opportunities that could be created in the rest of the region with the development of the 3,000-mile broadband interstate, announced by Congressman Rogers and Governor Steve Beshear, that is scheduled to begin in Eastern Kentucky before the end of the year and will be extended to the rest of the Commonwealth. "We're already doing high-tech business where high-speed Internet is available, but with Kentucky's new 'Super I-way,' we will be able to recruit even more complex businesses, and draw them to what I like to call Silicon Holler," said Rogers, referencing the high-tech jobs in the famed Silicon Valley. "The first phase of the broadband project is expected to be complete in the next 18 months, so now is the time to plan our work and work our plan." "Access to high-speed and high-quality Internet is no longer a luxury; it's a necessity in the 21st century economy. Businesses and schools demand it," said Gov. Beshear. "That's why Congressman Rogers and I announced an ambitious state and federal investment earlier this year to extend critically-needed high-speed broadband Internet access to the furthest reaches of the Commonwealth. This tour shows the region's leaders the opportunities that reliable, accessible and affordable high-speed internet can bring to a community." The underserved eastern Kentucky region will be the first priority area for the project, which will be supported by $60 million in state bonds and $40 million in federal and private sources. "This project will transform the future of eastern Kentucky. It will change the forefront of job recruitment, education, healthcare and tourism," said Jared Arnett, SOAR's newly named Founding Executive Director. "Recruitment for companies seeking this fiber optic infrastructure and low costs starts right now. With new resources allocated through SOAR and the collaboration of people from across all aisles, we are already engineering a new path forward for the people of this region." 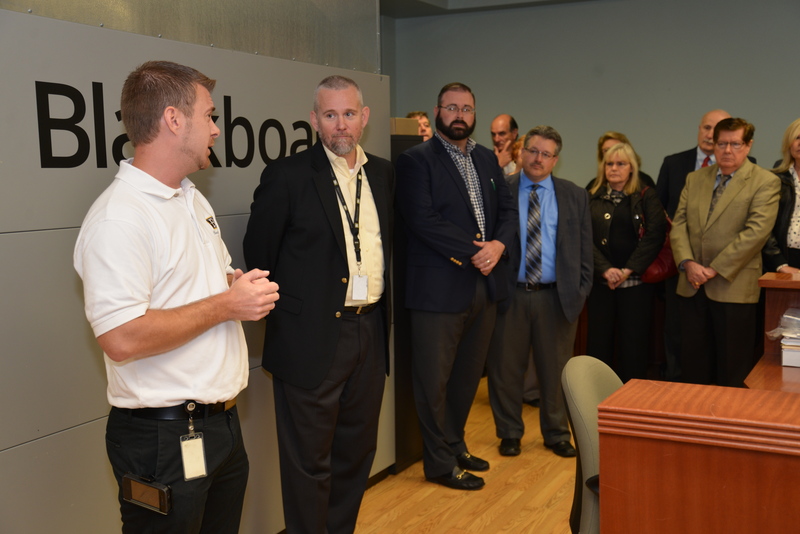 First stop: Blackboard, Inc. in the Valley Oak Technology Park in Somerset. Blackboard employs more than 400 people and operates a call center to support college students with financial aid issues. Second stop: Source H.O.V. in the South Rockcastle Industrial Park in Mount Vernon. More than 400 employees are working to digitize Veterans benefits claims by converting and indexing millions of paper documents into electronic formats for loading to the Veterans Benefits Management System. Source H.O.V. has been operating in Mount Vernon for more than 20 years. Third stop: Senture, LLC in London. Senture maintains steady employment of over 400 people in London, with an additional facility in Wayne County that can house up to 500 employees at one time. In addition to call center operations, Senture provides clients with data management and reporting, order processing and literature fulfillment. 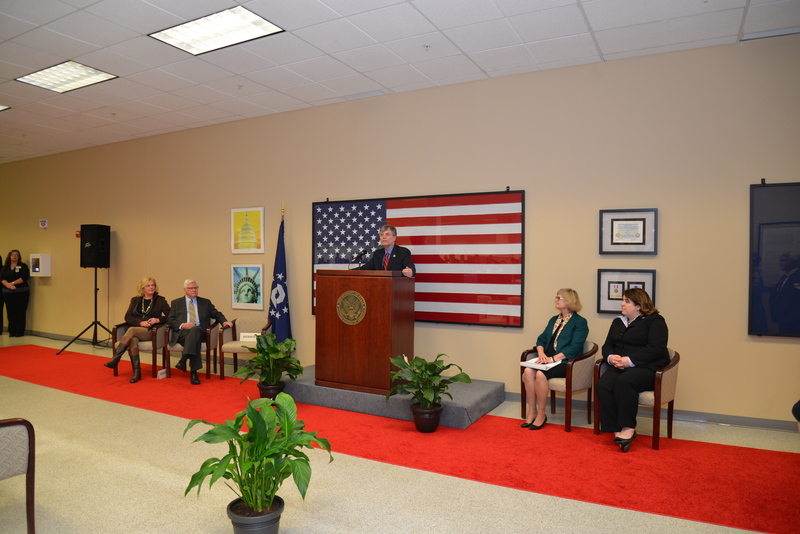 Fourth stop: Kentucky Consular Center in Williamsburg. The Kentucky Consular Center is a centralized processing center for nonimmigrant visa applications approved by U.S. Citizenship and Immigration Services, currently handling approximately 420,000 cases annually. Fifth stop: Troll and Toad, LLC in Corbin. In 1994, Jon and Lana Huston began selling collectible hobby games from their home. Thanks to expanded online sales, the company employs 145 people in a 26,000 square feet facility and has been named one of the fastest growing companies by Inc. Magazine. For more information about SOAR, visit http://governor.ky.gov/soar/ and follow SOAR activities on Facebook@ShapingOurAppalachianRegion and on Twitter @SOAR_EKY.